Washers emit a great deal of humidity, particularly when running on spin cycle. Concentrated water vapor in the air condenses on walls and other surfaces and can trigger mold growth as well as consequences such as deteriorated structural materials. Dryers require specific venting for fire safety as well as air quality protection. Lint produced by driers is a proven fire hazard when not properly vented. Released into the household environment, airborne lint can present health issues if inhaled. For best laundry room ventilation to remove excess humidity, a powered ceiling or wall exahust fan is required. The CFM (cubic feet per minute) specification of the fan should accommodate the requirements of the specific room based on square footage. Consult manufacturers instructions to determine the proper CFM. If a ceiling fan is installed, it must connect to a dedicated duct that extends all the way to an external opening at the roof or a wall. Never vent into the attic. Vent pipes connected to dryers exhaust heat, humidity and highly flammable lint through a metal duct. Per the International Building Code (IBC), the dryer vent duct must be of smooth metal to prevent internal lint accumulation. It should be four inches in diameter and no longer than 35 feet. Sharp bends or turns in the pipe must be minimized. The vent must extend all the way through the wall and exhaust directly into outdoor air. Due to fire hazard, flexible plastic dryer vent pipes common in the past are now prohibited by most local building codes. 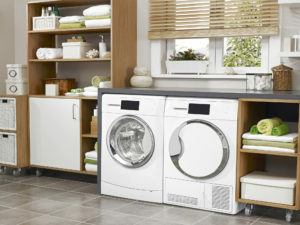 For more about proper laundry room ventilation, talk to the professionals at Hartman Brothers.